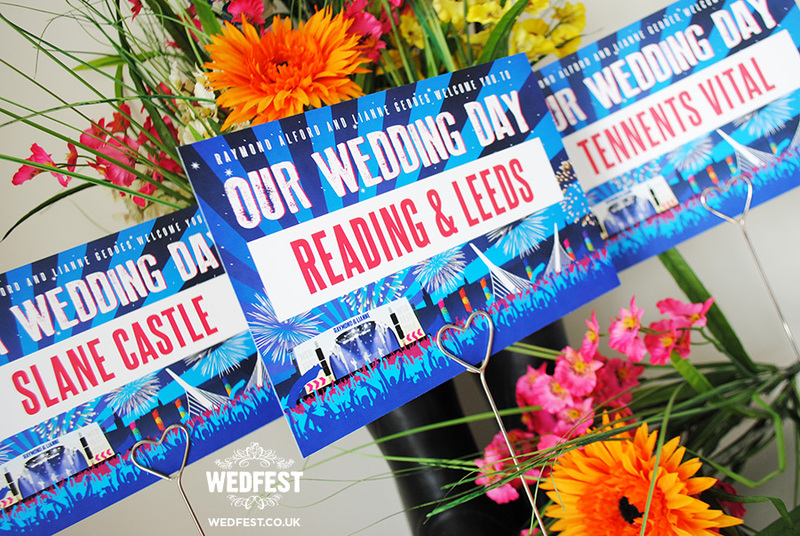 Big Weekend Festival Style Wedding Stationery – Each year BBC Radio 1 bring their Big Weekend Music Festival to a different city in the UK. Last year they brought it to my hometown of Derry~Londonderry in the year which Derry was also the City of Culture. This was the second time that Derry had hosted the Big Weekend Festival and by far the best one to date. 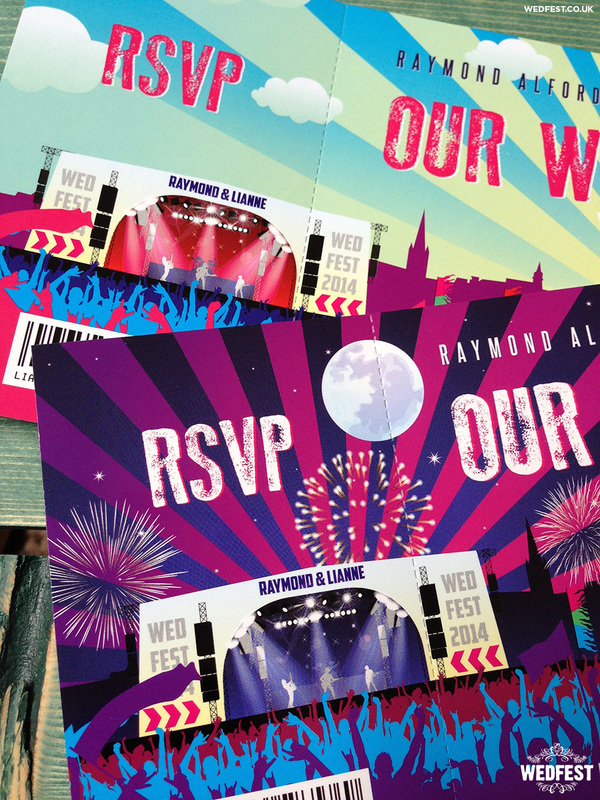 Inspired by this and their love of music festivals in general a couple called Lianne & Raymond got in touch with me looking for me to produce festival style wedding stationery for their upcoming wedding. From the very start Lianne said she wanted to theme it around the Big Weekend Festival and wanted to feature imagery of Derry in the designs. I couldn’t wait to get started and design some wedding stationery featuring my hometown of Derry. The Big Weekend festival itself took place in a place called Ebrington Barracks which overlooks the river foyle and over to the city of Derry. Joining the two is a beautiful white bridge called the Peace Bridge. While at the festival myself I kept fining myself glancing over at the city and seeing the bridge all lit of and thinking what an amazing sight it was and when I watched it back on TV it was clear that this backdrop also looked amazing on the TV. So with that in mind it was very easy for me to plan the design of the wedding invitations. 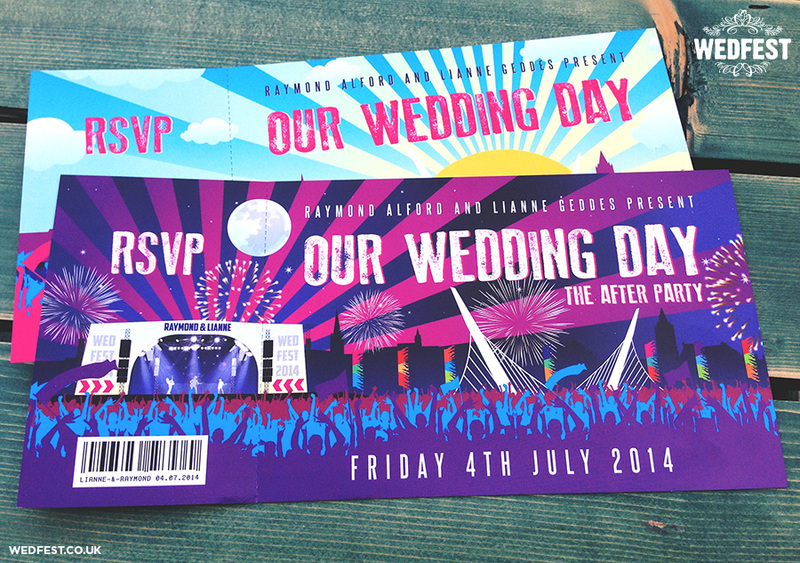 Based on a festival ticket layout the invites feature a large festival stage with a band playing live and the festival crowd in the foreground partying and dancing. In the background is the silhouette of Derry’s skyline featuring Derry landmarks such as the Cathedral and the Guildhall. The sun is setting over the city with sun rays going high into the sky and just beyond the stage and crowd is the image of Derry’s instantly recognisable (if you know it) Peace Bridge shining white in front of the city. 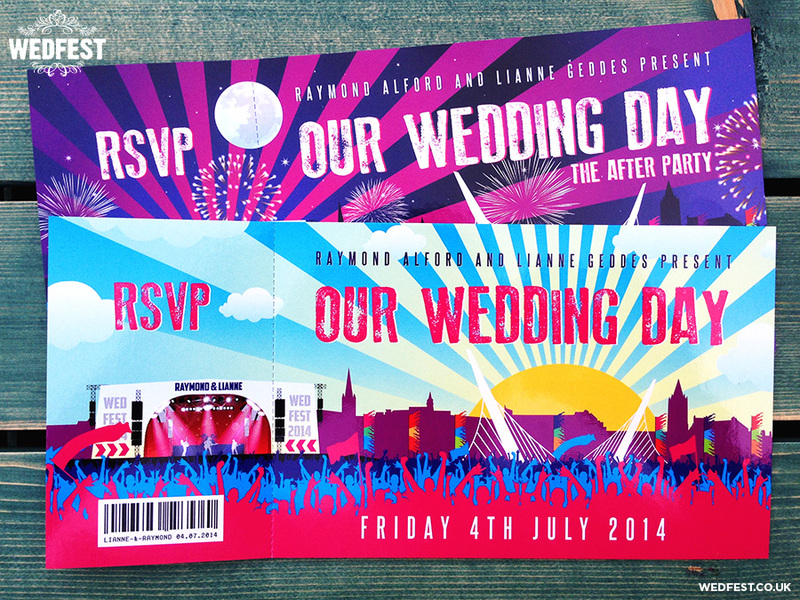 For the wedding evening invitations I kept the same design layout but changed the colours to suit a nighttime theme and I had imagery of fireworks going off above the festival and city which was exactly as it happened at the time. (wish we could go back to it!! ) 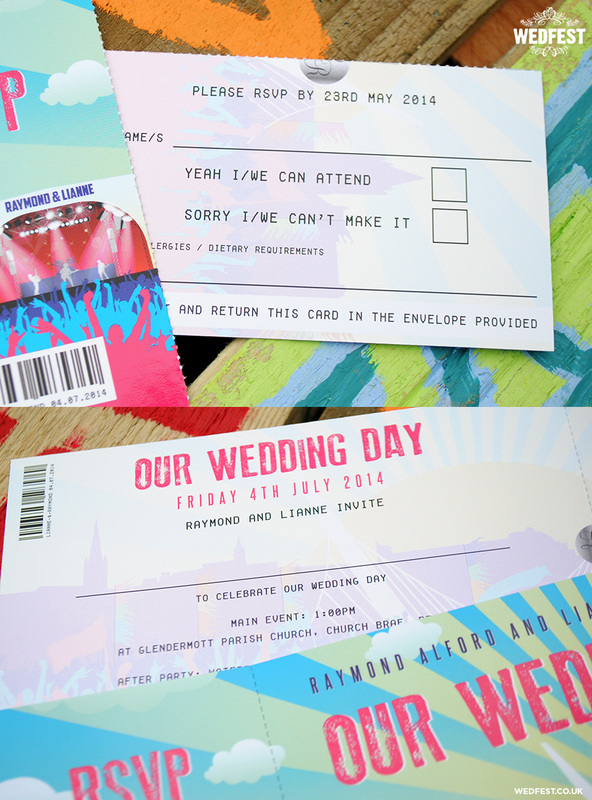 Like I mentioned the wedding invites were designed in a ticket style so the wedding guests could tear off the ticket stub which doubled as an RSVP card and easily send it back to the couple. The fireworks in the design also had a bit of a double meaning as the wedding date was 4th July which is best know for being America’s Independence day, and of course that means fireworks!! For the wedding day I also created the couple their wedding order of service booklets which also followed the same theme from the wedding invitations. 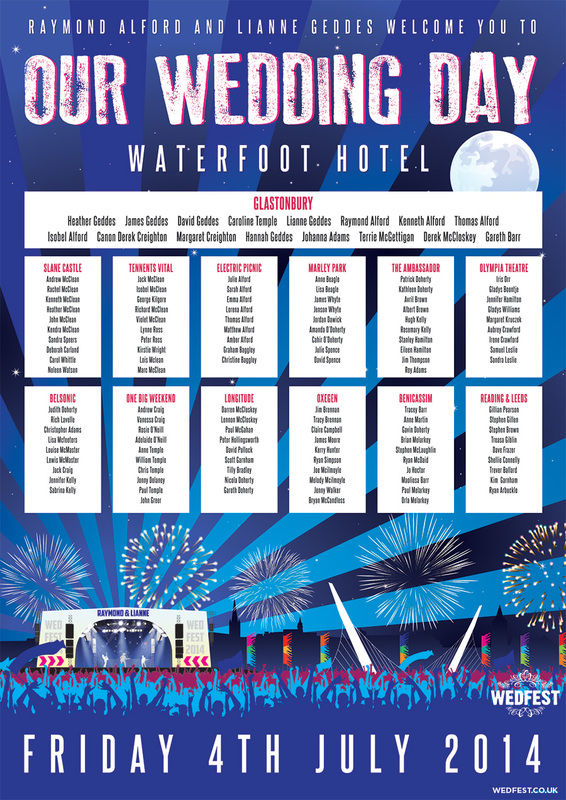 For the wedding reception which took place at the Waterfoot Hotel in Derry I designed the couple a Big Weekend Festival Wedding Table Plan in the style of a concert or festival line up poster. Again the design carried through from the earlier wedding stationery but for this I changed the colours to more blue tones to match in with the wedding theme colour and also to give it even more of a night time feel. 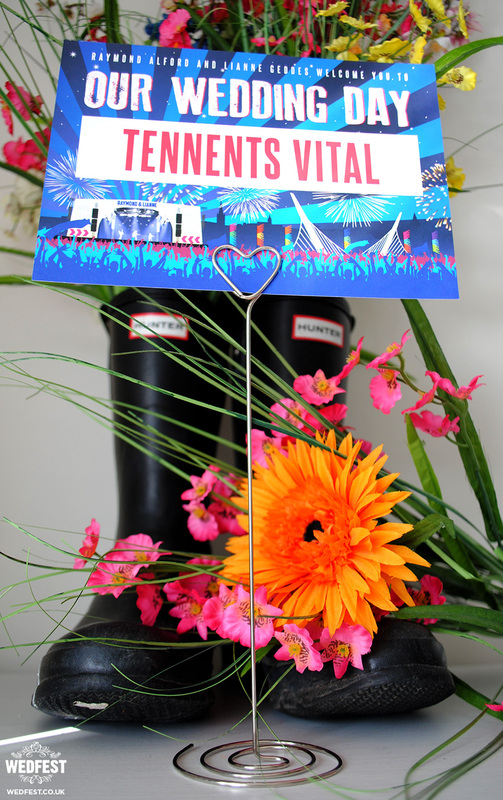 Each of the wedding tables was named after a music festival that the couple had attended such as Glastonbury, Electric Picnic, Belsonic, Benicassim, Tennents Vital, Oxegen, Slane Castle and many more. For the wedding tables I made the couple table centre cards that featured the name of each table so that the wedding guests could easily identify where they were seated once they found out which table they were sitting at. This was a great wedding stationery project to work on and I am really happy how it turned out. It was great to focus all the design on the city of Derry and also the Big Weekend Festival which I myself have been at quite a few times, most recently this year in Glasgow. 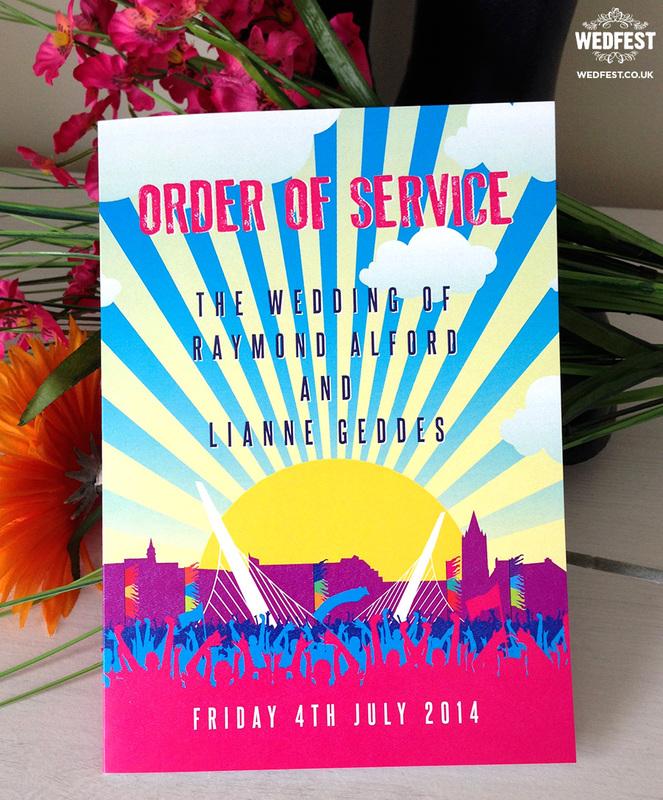 If you like the look of this festival style wedding stationery and want more information on wedding invites, order of service booklets, wedding seating plans or any of the stationery or designs that you see on this website please click here to get in touch.